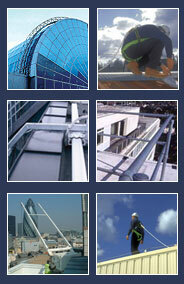 New working at height regulations (WAHR) came into force on April 6th 2005! Without a correctly tested and installed system any of the above falls could result in you being held personally responsible for the safety of your personnel. Falls from height have now been targeted by HSE in one of its eight priority programmes for 2005 and we have already seen a number of prosecutions for corporate killing where the company director has been given a large fine and a jail term. Don't start work at height until you have properly planned how you are going to do it, and you have assessed and controlled the risks involved. Ensure that you have fully considered all of the ways in which you could be at risk of falling. Don't underestimate the risks involved. Simply 'taking care' is not enough. Proper precautions must be in place. Consider whether there are other, safer ways of doing the job. Decide what equipment is required for the job. Ideally precautions should be designed to prevent a fall, for example using guard rails at a roof edge or crawling boards on a fragile roof. For some jobs it may be appropriate to use fall arrest equipment such as a safety harness. If you have not got the appropriate equipment then get it. Don't take a chance with a ladder if what you should be using is a tower scaffold. Making do without the right equipment to minimise expense can lead to injury or death, as well as prosecution if the law is broken. Ensure that there are no defects in any equipment that you use. Make sure that equipment is used safely and that any necessary training and/or supervision is provided.